As system designers browse through connector catalogs and interconnect websites for mezzanine solutions, we tend to expect their considerations to be focused on signal density, high-speed signaling capabilities, circuit counts and stack heights. However, a key factor that may be overlooked is the width of a mezzanine solution and the ability for air flow to get around it to cool the silicon on the motherboard. Some board designers use hardware, such as heat-sinks, to disperse the heat that is generated by a chip, while others use water cooling to flow around a chip to cool what is usually the most expensive component on a board. Many designers rely on fans to create airflow to push the hot air out of a chassis and bring in colder air for decreasing temperatures around a chip. When relying on air flow, it is important to take into account all of the components on a board and minimize any obstruction of that air flow so it can easily blow through the chassis. Thus, the width of a mezzanine connector system can play a major role in the obstruction of air flow so finding a narrow mezzanine connector design helps minimize that obstruction. This discussion gets particularly tricky if a design is shared between several engineers. For instance, many times a team will work on a system design so that team will include a mechanical engineer, an electrical engineer, a software engineer and a thermal engineer. Each person’s input will be critical in the overall success of a project, but each will have different priorities on a design. 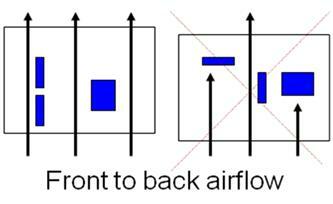 A mechanical engineer that is working on a board design may not take into account the mechanical outline of a connector and figure how that may impact the airflow that a thermal engineer will need to work with. If that design goes too far ahead on the mezzanine solution and the board layouts,it may be impossible to go back and redesign a mezzanine solution to optimize airflow for cooling. One of the reasons 2-row mezzanine solutions or the high density SEARAY* Slim are so popular is because they’re inherently narrow and will have little effect in air flow obstruction. The SEARAY design also has the benefit of Solder Charge Technology™ to fit 4 rows of terminals in a constrained width similar to that of 2-row mezzanine products. Mechanical designers then know if they use such a narrow solution it should make the job of their thermal engineer colleagues easier. And in this day and age, who doesn’t want to make jobs easier? *SEARAY is a trademark of Samtec, Inc.